Together, these medical experts can determine the best treatment for your specific type of lung cancer. Lung cancer is the leading cancer killer in both men and women in the United States. Lung cancer has the lowest 5-year survival rate among all common cancers, but the survival rate is more than 50% when detected at an early stage and it’s limited to one area of the lung. This is why early screening is so important. 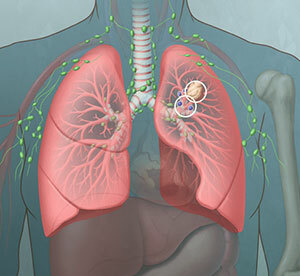 Early diagnosis and treatment with surgery and/or new techniques of chemotherapy and radiation therapy may cure many patients with lung cancer. 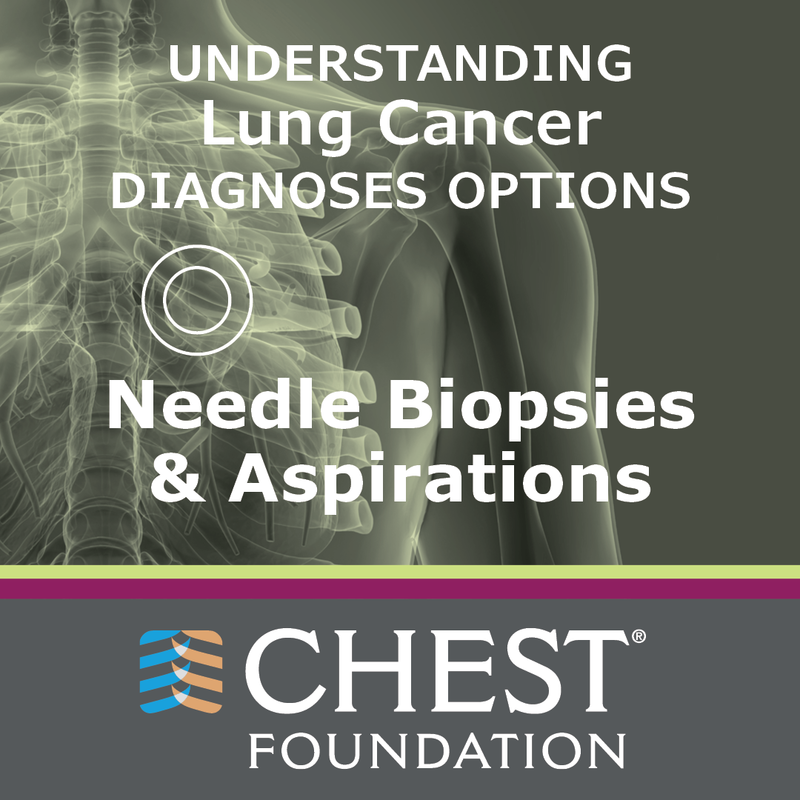 Watch the CHEST Foundation’s video on lung cancer biopsies to learn how lung cancer is diagnosed and how biopsies can aid in creating targeted therapies. 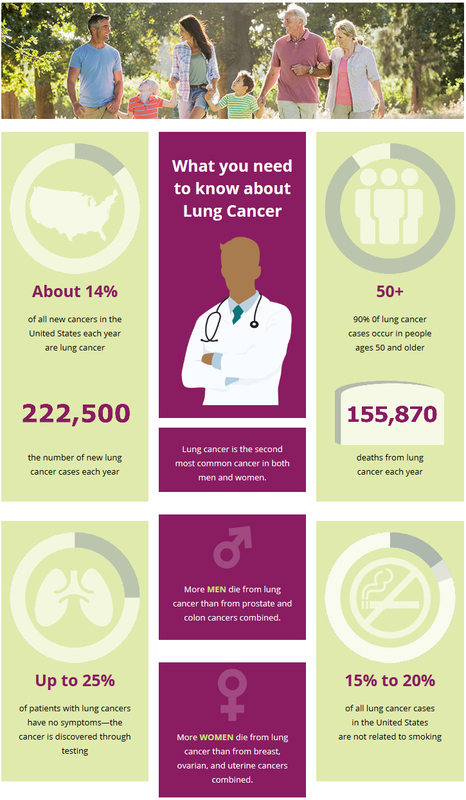 Small Cell Lung Cancer (SCLC) represents 10% to 20% of all lung cancer cases each year. SCLC tumors tend to grow more quickly than NSCLC tumors. They may initially be more responsive to chemotherapy. 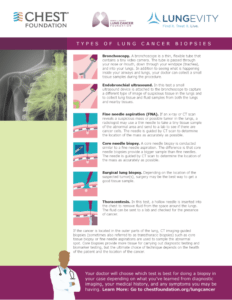 Different types of lung cancer often behave differently in the body. Treatment is based on the type of cancer and the stage of cancer. The stage is the extent of cancer. Is it in one area of the lung, or has it spread? Staging lung cancer is critically important. Treatments can vary depending on the stage. Lung cancer’s projected outcome, the prognosis, is also impacted by the stage. Lower stages, where the cancer is more localized, have a better outcome than advanced stages. 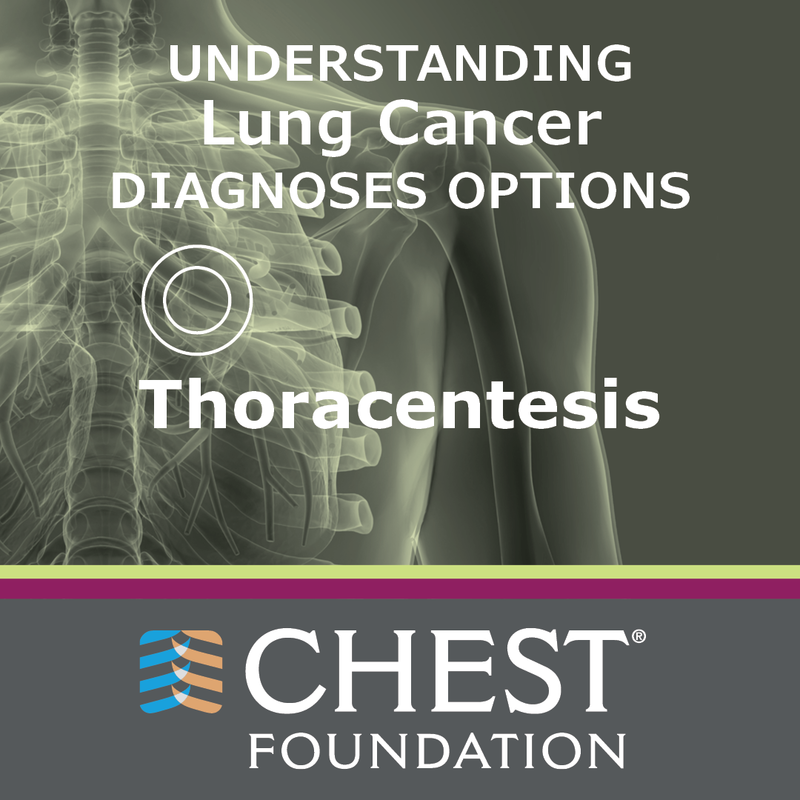 By understanding where the lung cancer is, and how and where it spreads, the medical team can create a specialized treatment plan based on the type and stage. Stage I: The cancer is in one part of one lung. It hasn’t spread. Stage II: The cancer is in one lung and nearby lymph nodes within that lung, called the hilar. Stage III: The cancer is in one lung and the lymph nodes between the two lungs in the middle of the chest. Stage IIIA: Describes lung cancer that has spread to lymph nodes on the same side of the chest as the cancer. It could also be cancer that has directly invaded adjacent structures like the chest wall, esophagus, or heart. Stage IIIB: Means that the cancer has spread from the lungs to the lymph nodes on the opposite side of the chest or above the collarbone. 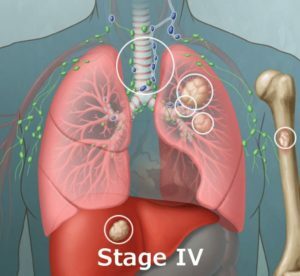 Stage IV: The cancer has spread to the space around the lungs (the pleura), the other lung, or to another part of the body, such as the brain, bones, liver or adrenal glands. The term “metastasis” is used in Stage IV cancer. This is when the cancer has spread beyond its original site in the lung to other, more distant parts of the body. Limited Stage: The cancer is found in just one part of a lung and nearby lymph nodes. Extensive Stage: The cancer has spread to other parts of the chest or body. It is likely that SCLC will soon have a four-stage system. This system better predicts outcomes. Any persistent, unusual, or unexplained symptom should be checked out by a doctor. Everyone coughs sometimes, but a cough that persists – especially with other signs, such as blood in the mucus or unexplained pain – should always be checked out. Like all cancers, lung cancer is best treated when caught early. Many symptoms are non-specific. They can be the result of other medical problems not related to lung cancer. People with COPD can have a chronic cough and repeated infections. See your doctor for an accurate diagnosis if you have any symptoms. The American Cancer Society estimates that 80% to 85% of all lung cancer cases in the United States are linked to smoking. This includes people who have quit smoking. Any kind of smoking seems to increase the risk of lung cancer. Smoking cigarettes, cigars, and pipes have all been linked to lung cancer. Smoking marijuana may also increase the risk, especially in young people. Exposure to secondhand smoke increases the risk. It is estimated that secondhand smoke causes more than 3,000 lung cancer deaths each year among nonsmoking adults. No one knows for sure the impact of smoking e-cigarettes (vaping) on lung health. E-cigarettes contain nicotine. Like tobacco cigarettes, they can lead to nicotine addiction. Some claim that inhaling e-cigarettes may be safer than tobacco smoking. Some think it may help smokers quit. There are no data to support these claims. Others believe that e-cigarettes may lead more young people to start smoking tobacco. More research is needed. Researchers are learning that certain genetic mutations are linked to lung cancer. Mutations are genes that work differently than their “normal” versions. People who have those genes may be more likely to get lung cancer. Having one of these genes may be why some nonsmokers get lung cancer. Other harmful substances can also cause lung cancer. Radon is a naturally occurring odorless, tasteless, invisible radioactive gas. People exposed to high radon levels are more likely to get lung cancer. In fact, radon exposure is a leading cause of lung cancer in nonsmokers. Radon levels can be high in underground mines. They are also high in tightly sealed, poorly ventilated homes, generally those with basements. Exposure to asbestos, a mineral-based substance once used in insulation and building construction, can cause lung cancer, especially in smokers. Air pollution has also been linked to lung cancer. Smoking is the single greatest risk factor for lung cancer. Regular exposure to secondhand smoke also increases the risk. The risk seems to be dose-dependent. In other words, the more you smoke (more cigarettes, more years), the greater your risk. Research shows that quitting smoking at any time of your life decreases your risk. A history of cancer in another part of the body. People with a history of head and neck cancer or esophageal cancer, both associated with tobacco use, are at higher risk. People who have had breast, colon, or prostate cancer, are at increased risk. Age. Lung cancer risk increases with age. Only about 10% of cases occur in people younger than 50. Family history. If one of your parents, brother, or sister has had lung cancer, your risk may increase. Prior radiation therapy. Radiation is an important cancer treatment. Radiation to the chest area, especially for treatment of another cancer, seems to increase the risk. Exposure to radon, asbestos, and/or industrial chemicals. Radon, asbestos, arsenic, beryllium, and uranium have all been linked to lung cancer. Anyone who has worked with them may have an increased risk. Other lung disease. Chronic obstructive pulmonary disease (COPD), interstitial lung disease, and tuberculosis (TB) may increase lung cancer risk. Scarring of the lungs from other diseases may set the stage for lung cancer. Having more than one risk factor also increases your odds of developing lung cancer. A smoker with asbestos exposure has about four times the risk of developing lung cancer as a smoker without it. It’s 80 times the risk compared with someone who neither smoked nor was exposed to asbestos. 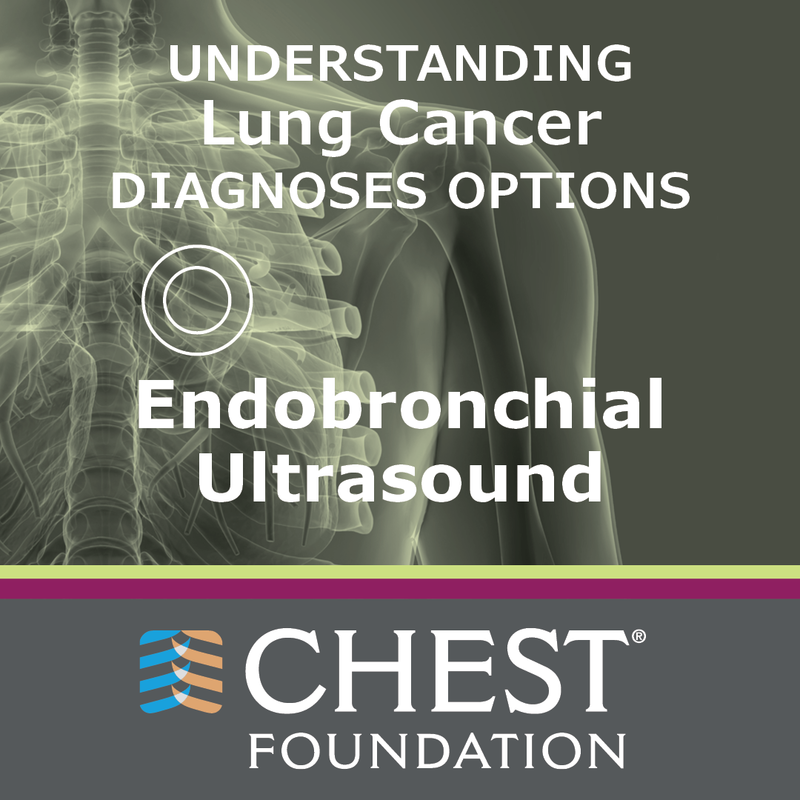 If you are at increased risk for lung cancer, ask your doctor about screening with a low dose chest CT Scan. Your doctor can help you weigh the risks and benefits. Chest CT scans don’t find all lung cancers. Sometimes they raise false alarms. If screening shows something suspicious, your doctor may to repeat the scan right away or in several months. This will show if abnormalities have disappeared or changed. Biomarkers indicate which treatment might work best. Your health-care team will also consider your overall health and wishes when planning your treatment. an entire lung (pneumonectomy). A person can survive with just one lung. Chemotherapy. Chemotherapy uses medications to kill cancer cells. Most chemotherapy drugs are given directly into the veins through an intravenous (IV) line. Some are pills (oral chemotherapy). In advanced NSCLC, chemotherapy can be used alone or with other cancer treatments. 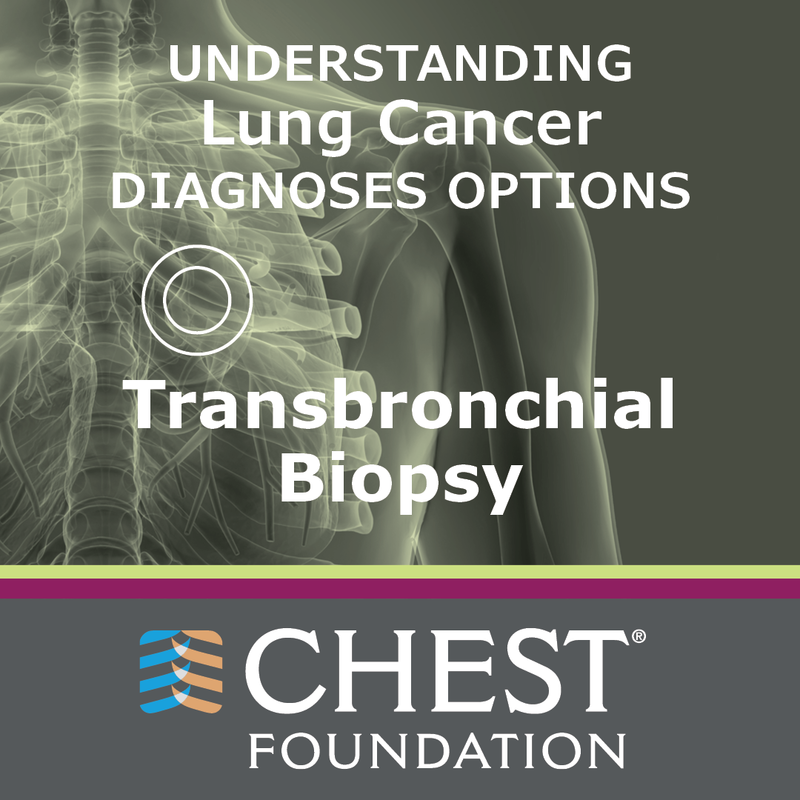 Chemotherapy with radiation therapy is the treatment of choice for SCLC that is limited to a defined area of the chest. A defined area can be safely targeted with radiation. Chemotherapy is usually given without radiation for patients with more extensive SCLC. If chemotherapy is delivered through veins, your doctor may suggest a “port.” A port is a special access line into a major vein in the upper part of the chest or arm. It is placed before chemotherapy begins. Ports are non-invasive. They are placed by interventional radiologists or surgeons. Ports, or other types of long-term access to veins, are commonly used for chemotherapy. This is because treatment often lasts many weeks or months. A port means that patients aren’t stuck with needles at every treatment. Sometimes, chemotherapy is given before surgery (called neoadjuvant). In some people with larger tumors, where surgery is the best first step, chemotherapy is given after surgery (or adjuvant). Chemotherapy with radiation is commonly used to treat patients with Stage IIIA and IIIB lung cancer. Chemotherapy is usually given alone in Stage IV. Radiation Therapy. Radiation therapy uses high-energy X-rays or other forms of radiation to kill cancer cells. It can be delivered in several different ways. In most cases, the patient lies on a special treatment table. A machine delivers invisible radioactive beams through the skin to the cancer. Radiation can harm healthy tissue. The radiation oncology team will carefully measure and mark the spot to get radiation. During treatment, the beams will be aimed at that precise spot. Each treatment takes only a few minutes. Stereotactic body radiation therapy (SBRT). SBRT radiation therapy focuses and intensifies each dose of radiation. It causes less damage to the healthy tissue near the tumor. Throughout the treatment, the strength and direction of the radiation are constantly adjusted. This targets any changes in the tumor (such as it getting smaller) and spares healthy tissue. SBRT delivers several doses, usually three to five treatments (one per day). Immunotherapy. This is a new therapy in NSCLC using drugs that make the immune system stronger. This helps your body fight its cancer. This treatment is used with stage IV cancer. Immunotherapy is a type of biological therapy. It enhances the body’s immune response and stop lung cancers from escaping the immune system. It doesn’t target cancer cells directly. Instead it trains your immune system to recognize cancer cells, and selectively target and kill them. or by suppressing factors that prevent the immune response. Immune checkpoint inhibitors have made the most progress. The first FDA-approved immunotherapy drugs for lung cancer are in this group. Immunotherapy is also being studied in SCLC. There are three FDA-approved immunotherapy drugs for metastatic NSCLC. Targeted therapies. Targeted cancer therapy uses drugs to attack cancer cells. It is used for some kinds of lung cancers. Researchers have learned more about the changes in cells that cause cancer. Drugs have been developed that directly target some of these changes. These drugs target specific parts of cells. They target signals that proteins send to cells that cause them to grow and divide uncontrollably. Radiofrequency ablation uses heat to kill cancer cells. It delivers heat through a thin, needle-like probe into the skin near the cancer. Photodynamic therapy (PDT) delivers a special light through a bronchoscope to cancer cells inside the breathing tubes. Laser beams through bronchoscopy, kill cancer cells in order to open blocked airways. Cryotherapy uses extreme cold to kill cancer cells. A thin, needle-like probe is inserted through a bronchoscope or into the chest wall, delivering treatment directly to the tumor. Your health-care team will discuss these options and whether they are right for your type of cancer. Side effects will depend on what treatments you receive and how your body responds. Remember that side effects can be eased with medication before you even start treatment. It’s common to give anti-nausea medication to lung cancer patients before chemotherapy. This helps with vomiting. Ask your doctors about the possible side effects. Ask what you can do to help manage them. Report ANY side effects to your doctors throughout your treatment. They can’t help you feel better if they don’t know what you are experiencing. Whether you’re going to see a primary care physician or cancer specialist, prepare for your visit. Consider bringing a friend or loved one. They may remember details of the visit that you forget or misunderstand. Some record their appointments with a cell phone or audio recorder. Take notes during your visit. Bring questions about any diagnosis or treatment information that may be confusing. Family practitioners and internists are doctors who have completed a residency in family medicine or internal medicine. They often find your cancer first. They work together with specialists and subspecialists to coordinate your care. Pulmonologists (also called pulmonary specialists) are doctors who specialize in diagnosing and treating lung diseases. They treat breathing problems caused by cancer or its treatment. Pathologists are doctors who specialize in identifying diseases. They use a microscope to look at tissue samples taken during a biopsy. The pathologist will diagnose the type of cancer and how advanced it is. You may never meet your pathologist. He or she will consult with other doctors on your team. Thoracic surgeons (chest surgeons) are doctors who specialize in surgery on the lungs and other organs inside the chest. A thoracic surgeon treats cancers of the lung, esophagus, and chest wall. Some have special training in surgical oncology. Medical oncologists treat cancer by using medicines, such as chemotherapy or targeted therapy. Your medical oncologist may refer you to other specialists. Radiation oncologists use X-rays and other types of radiation therapy. Surgical oncologists use surgery to diagnose and treat cancer. They can do biopsies and remove tumors. A thoracic surgical oncologist specializes in surgeries on lung tumors and other tumors found inside the chest. Diagnostic or interventional radiologists are doctors who specialize in diagnosing disease with imaging tests. These tests include X-ray, MRI, CT scan, PET scan, and ultrasound. Interventional radiologists use imaging tests to guide them in biopsies. A diagnostic radiologist may specialize in radiation oncology, diagnosing cancerous growths specifically. 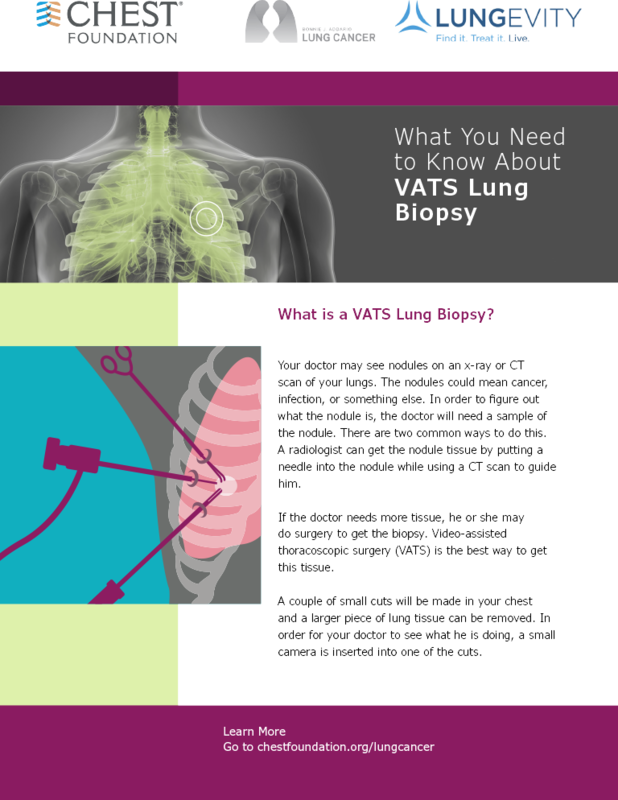 Having a radiologist with lung cancer experience can improve the accuracy of your diagnosis. Oncology nurses specialize in treating and caring for people with cancer. They are often a major point of contact for patients and their families. Respiratory therapists evaluate and treat people with breathing problems or other lung disorders. Social workers talk with people and their families about emotional or physical needs. They also help them find support. Registered dieticians use diet and nutrition to keep the body healthy. They help improve nutritional health. Information about your symptoms. What symptoms are you having? When did they start? Have they changed? Have you noticed new ones? Does anything relieve your symptoms? Does anything make them worse? Information about smoking. A complete description of smoking habits is very important. Did you ever smoke? If so, when did you start? How many packs of cigarettes did you typically smoke in a day/week? How long did you smoke? If you quit, when? Work history. A complete description of your jobs is also important, even if the job was years ago. People with work exposure to asbestos or other harmful substances may develop lung cancer long after the job ends. Complete list of your medications, supplements, and vitamins. Include all prescription and over-the-counter medications and supplements. These include herbal and natural remedies. If possible, bring the bottles and containers with you. That way your doctor can see exactly what you’re taking. Your medical history. Have you had cancer? What kind? What treatment did you undergo? Your doctor will want to know about any lung and breathing problems. If you have medical records at another doctor’s office, have copies sent to your lung doctor. Medical records. Bring all your medical records, especially any copies of old chest X-rays. Comparing current and old films tells the doctor about the likelihood of lung cancer. These records help your doctor determine which tests are needed. If suspicious tissue has been there for several years without changing, it is probably not lung cancer. Family medical history. Has anyone in your family been diagnosed with lung cancer? Does anyone in your family have a history of lung or breathing problems? Questions. Write down your questions. You won’t forget to ask them during your appointment. Which procedure will be used to diagnose my disease? Can we have my tumor tested? How will the tissue be removed? How severe is my lung cancer? What stage is my lung cancer? Is the cancer located anywhere else in my body? Are there any biomarkers in my tumor? What are the risks and benefits of my treatment options? What are the possible side effects to my treatment? How soon do I need to decide on a treatment? There’s no magic cure for lung cancer. You can do things at home to increase your comfort and improve your overall health. If you smoke, quit. It’s not easy to stop smoking. Your healthcare team can prescribe medication. They can refer you to local classes and support groups. Quitting smoking will keep you healthier. Get plenty of rest. It reduces stress, increases feelings of wellbeing, and may strengthen your immune system (the body’s natural ability to fight disease). Many find cancer treatment exhausting. You may feel wiped out after chemotherapy or radiation. Listen to your body. Rest when you feel tired. It’s okay to be active when you feel good. Healing takes time and energy. Keep active and exercise. You may not feel like doing it, but exercise is helpful. Studies now show that it can help reduce lung cancer symptoms and side effects. It can also improve quality of life. Talk to your doctor to find a safe program for you. Try to do be active every day – even if it is a long walk. Eat a healthy diet. It’s not easy to eat well. It’s hard to eat at all if cancer treatment affects your appetite and sense of taste. Getting enough calories and nutrients supports healing. Tell your health-care team if eating becomes a challenge. Your physician may prescribe medication. Some medications can stimulate appetite. Others relieve mouth sores or soothe nausea. Your doctor may also recommend nutritional supplements. Many cancer centers have nutritionists on staff. A nutritionist can help with an eating plan that meets your needs. Get emotional, spiritual, and psychological support. Few things hit harder than a cancer diagnosis. You may feel stunned, angry, upset, sad, frightened, or overwhelmed. Sometimes, you may feel all of these emotions at once. This is completely normal. Anxiety and depression may begin to negatively affect your work or relationships. That might be time for professional help. Talk about your feelings with your healthcare team. Your doctor can assess you for clinical depression. If appropriate, he or she can prescribe medication and/or refer you to a professional counselor or mental health professional. Some patients find a spiritual or religious advisor helpful. Don’t forget that a diagnosis of lung cancer can be stressful for the entire family. Your family members may feel as overwhelmed as you do. Support groups can help both patients and families. Talking to others who have had or are living with lung cancer can help. Many patient advocate groups offer support and survivorship services. LUNGevity offers online and peer-to-peer support. It includes a toll-free helpline and PhoneBuddy program. The Lung Cancer Alliance maintains a list of online and in-person support groups across the country. CancerCare also has lists of support groups. They offer online phone counseling with social workers who specialize in cancer care. Many hospitals and health-care organizations host lung cancer support groups. Ask your health-care team what support options near you. It’s important to answer the first two questions as quickly as possible. Activities to find the answers must be done correctly. This may take a little longer. The best treatment plan for you depends on accuracy in the diagnosis and staging of your cancer. Your health-care team will ask you lots of questions about your health. They will take a full medical history. They will also perform a thorough physical exam. Tests will be ordered to assess what’s causing your symptoms. If the tests suggest cancer, additional tests will be done. Test results help your medical team get an accurate diagnosis and stage. Only then can they develop your treatment plan. Chest X-rays. A chest X-ray is painless. Doctors look at your lungs and airways. Chest X-rays can show spots (nodules) or other abnormal areas. There’s no way to tell from an X-ray whether any are cancerous. If your chest X-ray looks suspicious, more tests will be required. CT scans. A CT scan (sometimes called a “CAT scan”) uses X-rays to create crosssectional pictures. They provide more detailed pictures of the size and location of abnormalities found on a chest X-ray. Positive-emission tomography (PET scan). In this test, a radioactive sugar is injected. It provides data about whether something seen on a CT scan is metabolically active (changing or growing). PET scans can tell if a tumor is spreading from the primary site to other parts of the body. Bronchoscopy. A bronchoscope is a thin, flexible tube that contains a tiny video camera. The tube is passed through your nose or mouth. It goes down through your windpipe (trachea) into your lungs. This allows the doctor, usually a pulmonologist or thoracic surgeon, to see inside your air passages. They can take small tissue samples (biopsies) and fluid samples. Samples are sent to a lab and checked for cancer. Navigational Bronchoscopy. A kind of bronchoscopy that uses a GPS like system to locate and biopsy lung nodules that are beyond the reach of conventional bronchoscopy with safety and accuracy. Endobronchial Ultrasound. This test is sometimes used during bronchoscopy. It not only diagnoses lung cancer, but can also see if it has spread to the lymph nodes (staging). The bronchoscope has a sound-wave probe on the end. Doctors can locate and see masses and lymph nodes next to the airway, but not within the lung. Doctors then use needles to sample the mass and/or lymph nodes to check for cancer. 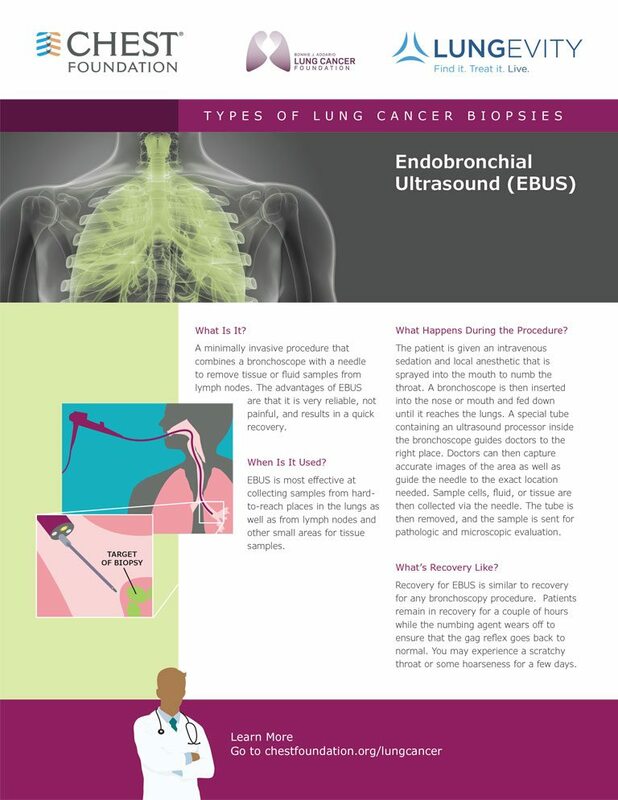 Endobronchial ultrasound is not offered at all hospitals and medical centers. Needle Biopsies. If a CT scan shows a suspicious mass or nodule or possible tumor, radiologists can use a CT scan to biopsy the abnormality. Samples can be taken through small or large needles in order to provide sufficient material for diagnosis. Surgical lung biopsy. Depending on the location of the suspected abnormality or tumor, surgery is sometimes best for getting a good tissue sample. Ultra sound Guided Thoracentesis. This test may be done if there is an abnormal fluid collection between the chest wall and the lung, an area known as the pleura. (pleural effusion also describes fluid collection from the pleura.) In this test, the fluid is found in real time with an ultrasound machine. The location is marked and the skin on the chest is thoroughly numbed. 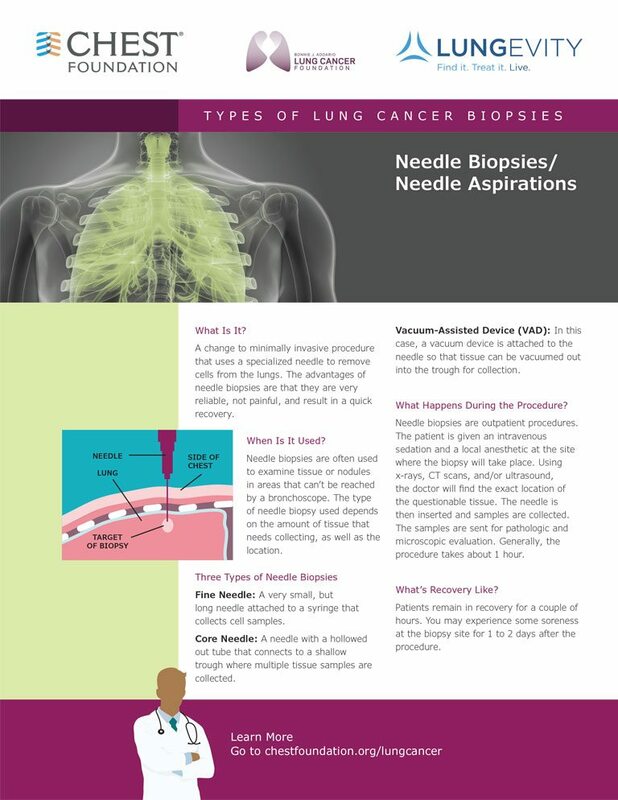 A needle is inserted into the space around the lung. Fluid is removed. It is sent to the lab to check for cancer. Medical thoracoscopy. 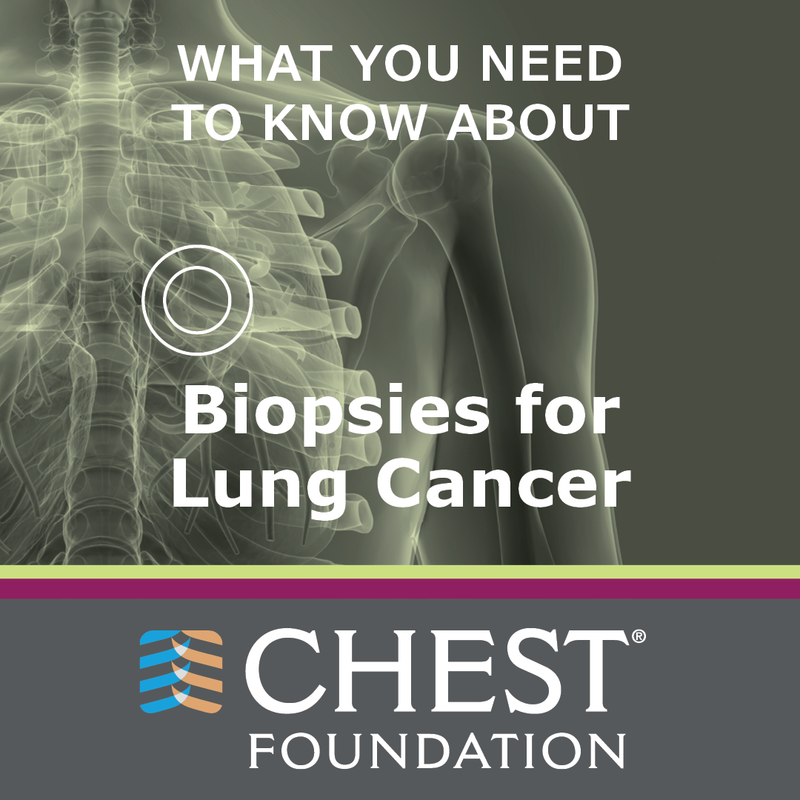 This test may be done to biopsy the inside layer of the chest. This is called the pleura. It is when thoracentesis does not provide a diagnosis. It is done under monitored anesthesia and ultrasound guidance. A small camera is inserted into the chest cavity. The pleura is inspected and biopsied. The test is safe and accurate. Patients may go home the same day. It may also relieve, the symptoms of fluid through a modality of techniques at the same time. Biomarker testing. Tumor tissue from a biopsy can be tested for certain features of cancer cells, or biomarkers. This gives speciﬁc information about the tumor. 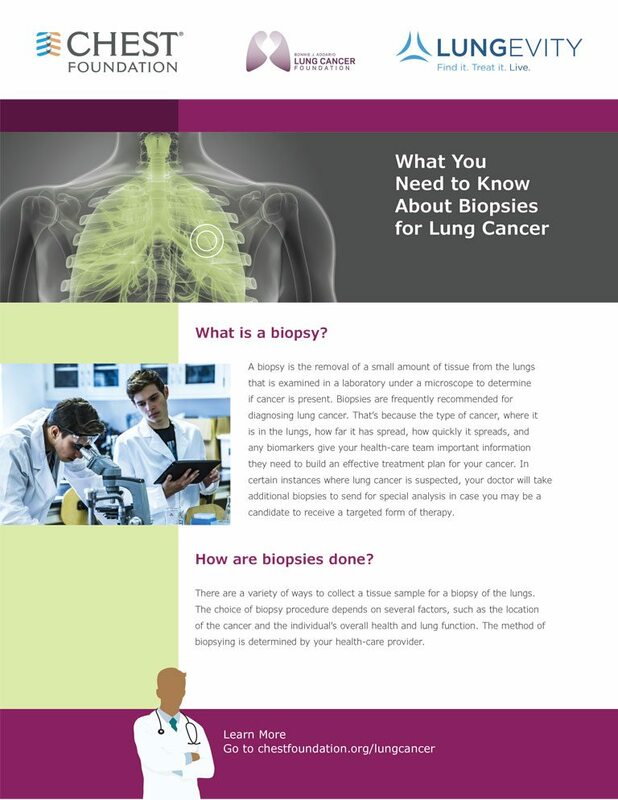 Biomarker testing gives doctors more information about your lung cancer. Personalized information is important. All lung cancers are not the same. Biomarker testing helps your doctor decide which treatment is best for you. 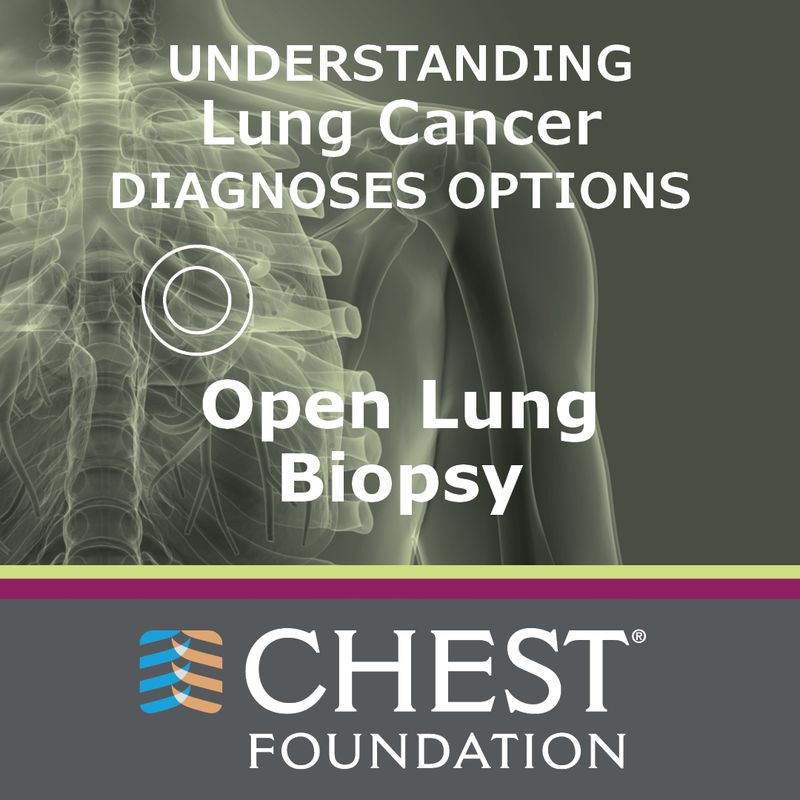 These tests not only identify the lung cancer, but also help determine the stage. This helps your health-care team plan your treatment. Click any image below to download and share on social media.